Calculating the direction and intensity of the smell from a T. rex. Note wind direction and speed at bottom. 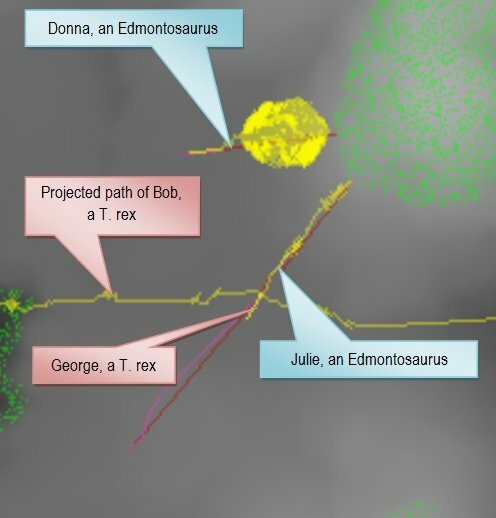 The red line is the direction that the T. Rex named Bob’s scent is being carried. Angle from Gertie to Bob is blue line. Screen capture from Dinosaur Island AI testbed (click to enlarge). 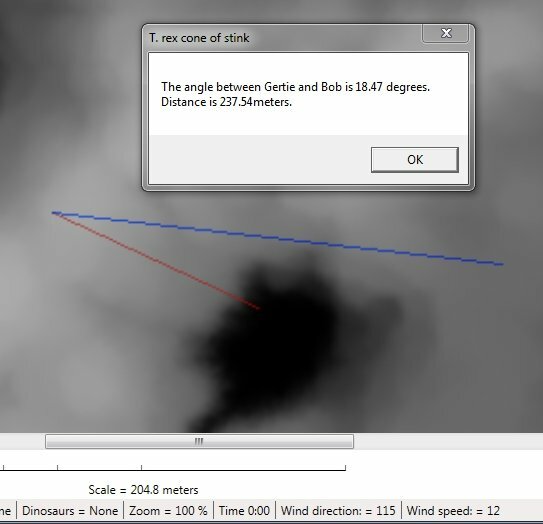 Yes, it has come to this: we are calculating the ‘cone of stink’ of a T. rex. I’m working on not just the ‘combat models’ for Dinosaur Island see (“Creating a combat model for T. rex versus Edmontosaurus regalis“) but the AI that drives the decisions and actions of the dinosaurs as well. While creating the AI I realized that scent was probably as important as sight to any dinosaur that didn’t want to become dinner. At the same time, predators – successful predators – should take wind direction into consideration when planning their attacks and consequently maneuver to be downwind of their prey. After watching a number of predator / prey scenarios in Dinosaur Island I became convinced that the T. rex didn’t just see an Edmontosaurus from 500 meters away and start charging towards it. I think the T. rex maneuvered into position (downwind) and only then ran at top speed when it was within 50 meters of the victim. I don’t think that a T. rex had energy to burn – and they sure burned a lot of energy running with all that weight at top speed – and even an unarmored prey like Edmontosaurus could pack a terrific wallop with its tail if it was forewarned. As we shall see in the next few postings, dinosaur predators were not just big dumb brutes and scavengers. For them to survive they had to plan their attacks in advance or be incredibly lucky. Also, we shall see how ‘olfactory acuity’ and ‘angle of vision’ played an important role in detecting predators before it was too late for big herbivores like Edmontosaurus and that the key to their survival involved group defensive tactics. T. rex (AI) successfully locates and hunts prey on Dinosaur Island. A T. rex named George successfully found, tracked, pursued and attacked an Edmontosaurus named Julie. Click to enlarge. It has been said that nobody wants to see how politics or sausages are made. Artificial Intelligence (AI), for some, may also be added to that list. 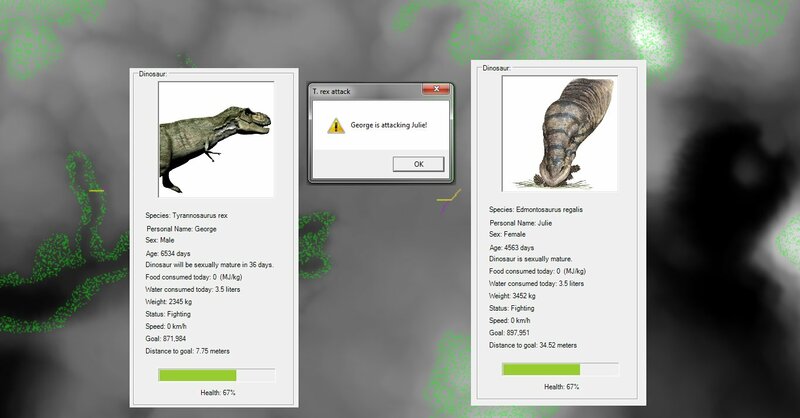 Today’s blog topic is about achieving an important milestone in the AI behind Dinosaur Island: a T. rex ‘looked’ around his virtual world (using a 3D line of sight algorithm), spotted potential prey (an Edmontosaurus regalis named Donna) pursued it using an optimized A* least weighted path algorithm that avoided steep slopes and boggy terrain (the attack was up hill) , then saw a more attractive target (an Edmontosaurus regalis named Julie), changed his pursuit and successfully overtook the prey. Screen capture with all AI tracing turned on. There are three dinosaurs in this image. 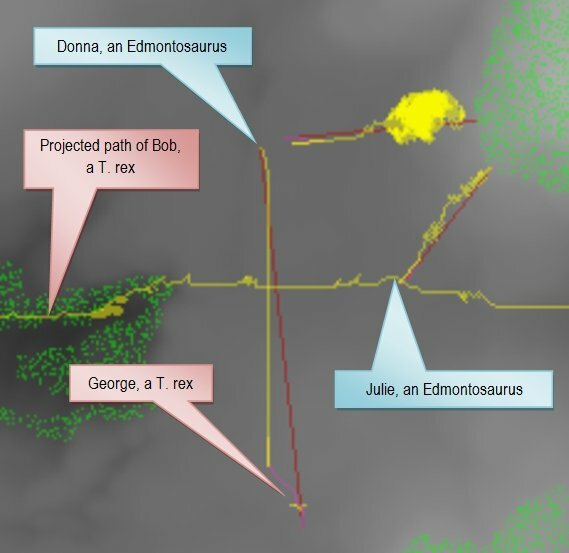 George sees Donna (dark red line), Donna is looking almost due east (dark red line) at the forest of Araucaria trees where she wants to go to eat, the cloud of yellow is the AI looking at alternative paths for Donna to climb up a hill, Julie is also looking at the same forest of Araucaria trees to her northeast and the AI (yellow path) has plotted the best route for her to climb the hill. (Click to enlarge). This screen capture taken 10 seconds later shows Donna approaching the Araucaria forest to the east and Julie climbing the hill towards the same forest to the northeast. George now sees that Julie is the closest prey and switches his attack to her (dark red line) and races toward her. (Click to enlarge). Ten seconds later, George has closed the distance and has attacked Julie from the flank. (Click to enlarge). It’s important to remember that Dinosaur Island will ship in full 3D; these screen shots are of the AI testing environment which is in 2D. Now that we have created a ‘perfect killing’ AI we will have to make it ‘stupider’ by adding distractions and imperfections. Are we making the dinosaurs too smart? 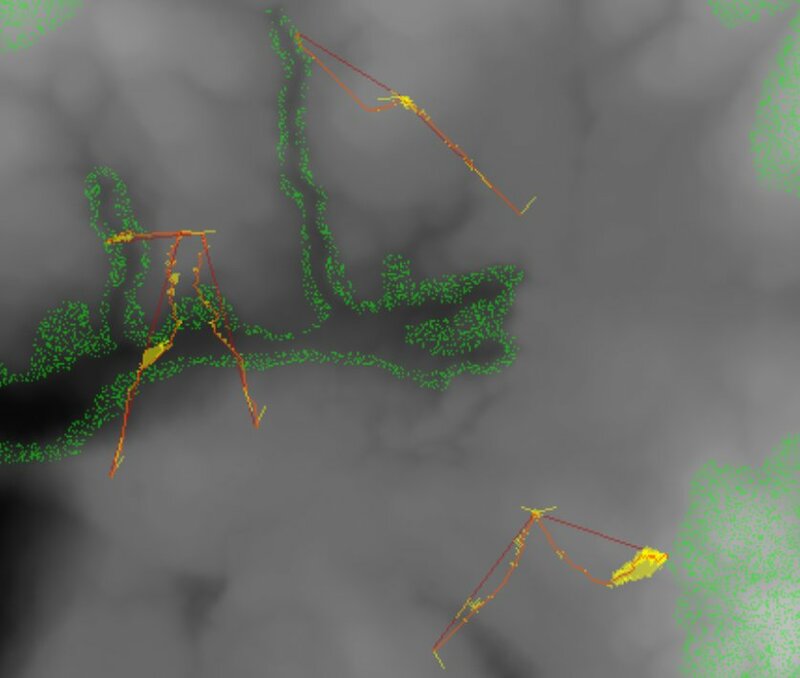 Traces of the artificial intelligence (AI) calculations for dinosaurs’ optimal paths to food. The AI chooses paths with least steep slopes and avoids terrain (like swamps) that would unnecessarily slow the dinosaur down. Screen capture. Yes, I know in Jurassic Park velociraptors could open doors (I would post a picture, but I’m worried about lawsuits so here’s a link to the clip instead). Luckily, on Dinosaur Island we don’t have any doors, kitchens, cages, Land Rovers or electric fences so we don’t have to worry about writing the artificial intelligence (AI) routines for the dinosaurs to deal with these objects. Instead, we’re interested in if the dinosaur can see the food (I discussed 3D line of sight algorithms in, “Dinosaurs, tanks and light of sight algorithms,” here). And, if and only if, the dinosaur can see the food, how does the dinosaur get to the food? The fastest way for the dinosaur to get to the food can be solved using a least weighted path algorithm which I discussed in this blog here. Now, the question is, “are we making the dinosaurs too smart?” The image at the top of today’s blog is a screen capture of the AI ‘looking’ at different ways to get to the objective (in this case, food that has been identified previously using the 3D line of sight algorithm). From literally thousands of possible routes (some only deviating by a meter from another possible route) the optimal, or fastest route across the landscape (avoiding steep hills and terrain that would slow the dinosaur down) is chosen. Is this really how a dinosaur thought? Probably not. What I suspect, and again, I’m a computer scientist, not a paleontologist, is that dinosaurs, especially a dinosaur pursuing prey, ran straight towards the target until it encountered something (an obstacle, a steep hill, swampy land) and only then considered going on an alternative path. So, I will probably rewrite the AI so it’s not optimal. But for now, we’ve got some really smart predators on Dinosaur Island. Not opening doors smart. But smarter than the real thing. Below is a screen capture of the optimized AI least weighted path algorithm. 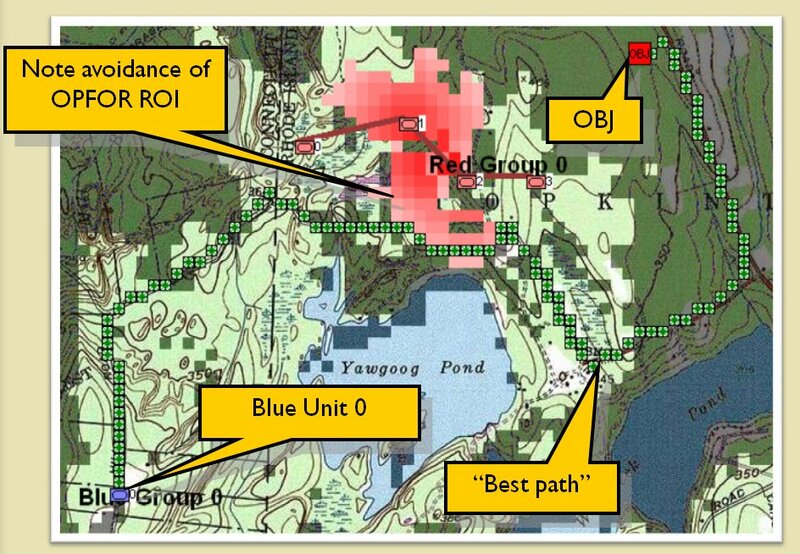 Screen shot of optimal least weighted path algorithms (taking slope and terrain into effect). Dark red lines: 3D Line of sight (the food that the dinosaur is looking at). Orange lines: final path for dinosaur. 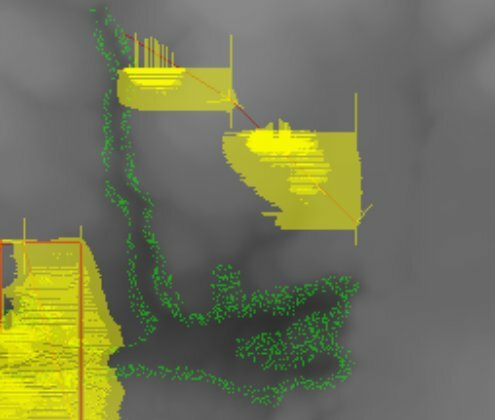 Yellow areas: alternative paths that were evaluated and discarded. Screen capture (click to enlarge). How fast could a hungry dinosaur run? There are a lot of fascinating web sites that attempt to answer the question, “how fast could a dinosaur run?” One site (The University of Sheffield) even has an online calculator (click here). However, all of these sites – and the University of Sheffield calculator – are based on measuring the stride (the space between dinosaur footprints) and then using a formula (v = 0.25*g0.5*SL1.67*h-1.17 where (v) is the animal’s speed, (h) its hip height and its (SL) its stride length) to calculate the speed of a particular dinosaur in a particular place ‘frozen in time’. Was the dinosaur running as fast as she could? What kind of terrain was the dinosaur walking on? Since the measurements are made from preserved dinosaur trackways, the dinosaur was probably walking across wet sand. Dinosaurs could certainly run faster on dry flat land than on swampy land. What effect did walking up a slope have on a dinosaur’s speed? 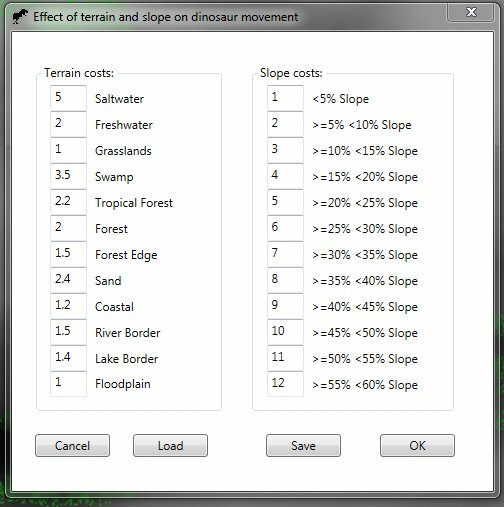 Dialog box from Dinosaur Island that allows the user to modify the cost of traversing different terrain types and climbing up slopes. 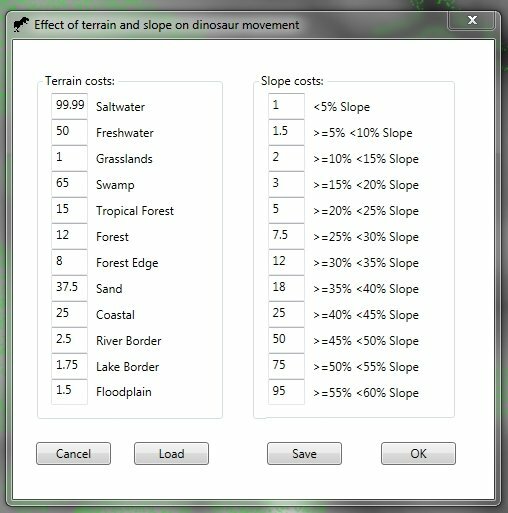 Above is a dialog box just added to Dinosaur Island for adjusting the values of the ‘cost’ of walking across various terrains and the cost associated with climbing slopes of different steepness. These costs are used in the least weighted path algorithm that we discussed yesterday (see How a dinosaur is not like a tank). Least weighted path algorithms are what make computer controlled characters (like dinosaurs) behave naturally and make intelligent decisions. As Ed Isenberg commented yesterday (here) there is no reason to think that dinosaurs, especially predators, could not make intelligent decisions about the most efficient way to get to their dinner. Least weighted path algorithms and terrain and slope costs, are some of the methods that ensure that Dinosaur Island will be the most accurate and detailed simulation of life in the Cretaceous yet created. Below is a screen capture of the current values that we are using in Dinosaur Island for least weighted path calculations. These are the values that were used when calculating the movement paths displayed here. 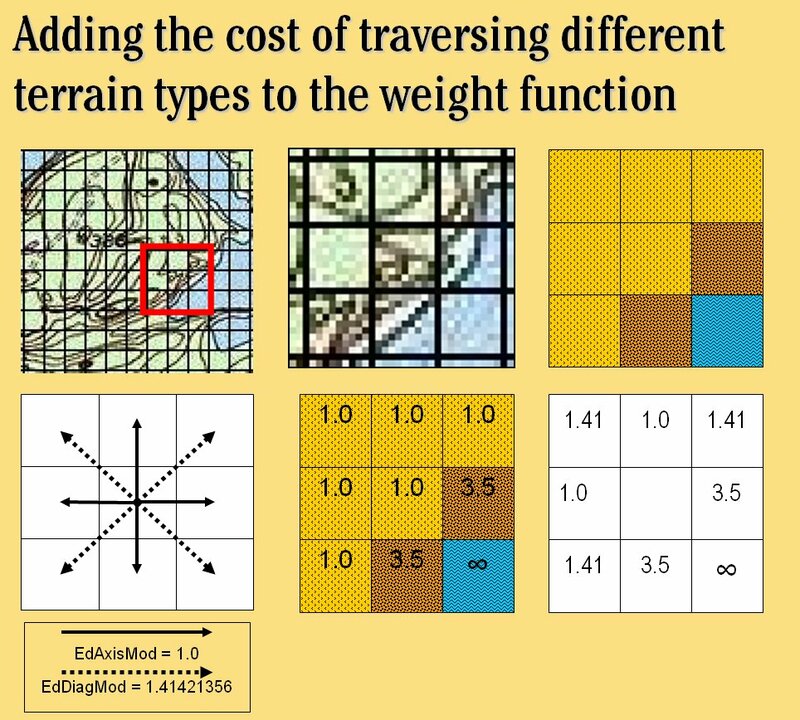 The current values being used for terrain and slope least-weighted path calculations (screen capture). How a dinosaur is not like a tank. A cross-section view of the elevation that a T. Rex (named Bob) will have to traverse to get to an Edmontosaurus regalis (named Gertie). A very steep riverbank is between Bob and Gertie. Vertical axis: elevation in meters, horizontal axis: distance to goal in meters. Click to enlarge. A few days ago I wrote about Dinosaurs, tanks and line of sight algorithms and how my previous work in modeling and simulations (M&S) for military wargames (specifically line of light algorithms) was applicable in Dinosaur Island. Today I am working on the models for dinosaur movement, speed, and what are called “least weighted path” algorithms. The most fuel efficient route? The route that avoids certain features (such as specific terrain, topography or extreme slopes)? These options are what ‘weight’ the potential routes in a ‘least weighted’ path algorithm. For example, taking the Interstate is often the fastest route (least amount of time) but frequently is not the shortest route (least amount of distance). Back in grad school I did my ‘comprehensive exam’ for PhD students on the subject of least weighted path algorithms. There are two very popular algorithms that solve this problem: one is Dijkstra’s algorithm (which is an exhaustive search solution) and the other is the A* algorithm, by Peter Hart, Nils Nilsson and Bertram Raphael. The primary difference between Dijkstra’s algorithm and the A* algorithm is that Dijkstra’s is guaranteed to return the optimal solution but it often takes the most time to calculate. The A* algorithm is much faster to calculate but is not guaranteed to return the optimal (or perfect) solution. In computer games we almost always use the A* algorithm because speed of calculations (especially over large maps) is more important than having the absolutely perfect route. At the bottom of this blog are links to descriptions of these algorithms and my research paper discussing an optimization of A*. But, what does this have to do with dinosaurs and tanks? We also want the tank to take advantage of roads and avoid swamps, rivers and ponds.The maximum speed of a tank traveling on a road is higher than the maximum speed of a tank traveling across a field. This is not the case with a T. rex or an Edmontosaurus regalis. Another difference between tanks and dinosaurs is that as long as a tank has fuel it can go at 100% of their maximum speed (on a specific terrain) without problems. This simply isn’t the case with dinosaurs. As dinosaurs expend energy (and remember, energy is the ‘currency’ of Dinosaur Island, see: The currency of Dinosaur Island) they get tired and they can’t run as fast or as far. Also, dinosaurs run at their maximum speed only for short distances and only in extreme emergencies or at the very end of a hunt when they attack. The illustration at the top of the blog also points out another major difference between tanks and dinosaurs: modern tanks (specifically the M1A1) has a published specification of being able to climb a 60 degree slope at a speed of 7.2 km/h (see here). That’s pretty impressive. It’s unlikely that that a T. rex could navigate a slope that steep. 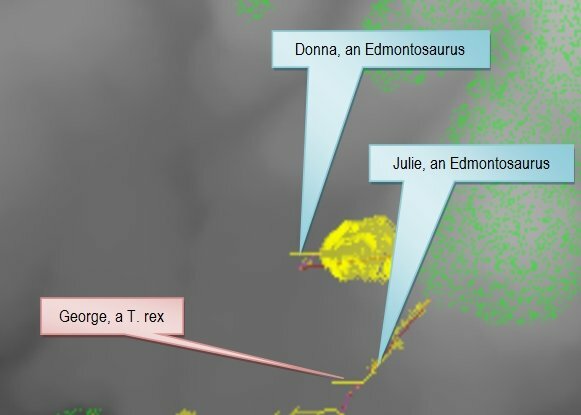 In the cross-section at the top of this blog we show the slopes that Bob, the T. rex, will encounter following a straight line to Gertie, the Edmontosaurus. Clearly we’re going to need to use a least weighted path algorithm for calculating dinosaur movement so that they will avoid steep riverbanks and crevices. We also will create a table of ‘energy costs’ that dinosaurs will incur as they travel across various terrains (like swamp). These values will be used in our least weighted path algorithm. Dijkstra’s algorithm on Wikipedia has a very easy to follow description with a couple of cool animations to show how it works. Link here. A* search algorithm on Wikipedia also has a couple of very nice animations to show how it works and pseudocode. Link here. By the way, I once sent Nils Nilsson an email asking him what the ‘A’ in A* stood for and he replied, “algorithm.” Now you know. “An Analysis of Dimdal’s (ex-Jonsson’s) ‘An Optimal Pathfinder for Vehicles in Real-World Terrain Maps,‘ the paper for my Comprehensive Exam can be downloaded here.